When shopping centers begin to resonate with the sound of traditional Chinese instruments, that’s when you know that Chinese New Year is around the corner. It’s time to usher in the Year of the Rooster and to reunite with loved ones for at least a day of catching up and scrumptious dinners, dressed to the nines in red. 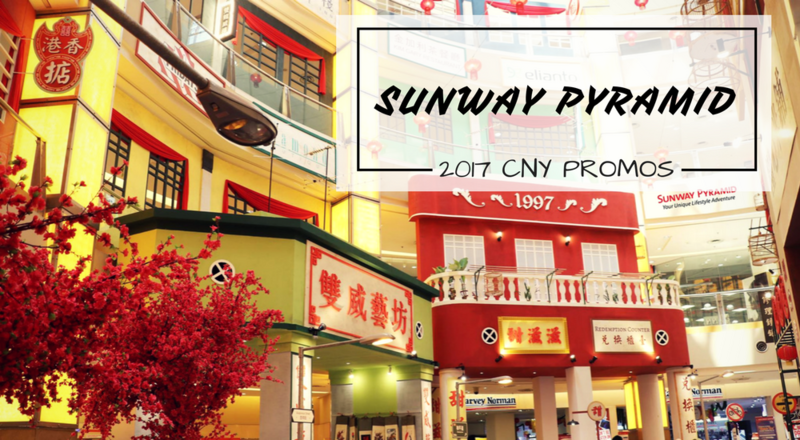 To help you decide on where to go with friends and family for CNY, and where to spend those precious Ang Pao offerings in, we’ve compiled a list of promotions and deals that you can find in Sunway Pyramid, dubbed Innovative Shopping Centre in 2015 by the Malaysian Tourism Awards. They may be a German restaurant, but Brotzeit is offering its own version of a Chinese New Year themed platter, serving up roast duck, pork, saukeraut, red cabbage, potato salad and even topping it off with German dumplings to mark the occasion. The platter includes starters of Pancake Soup and Brotzheit’s signature ‘Emperor Cake’. 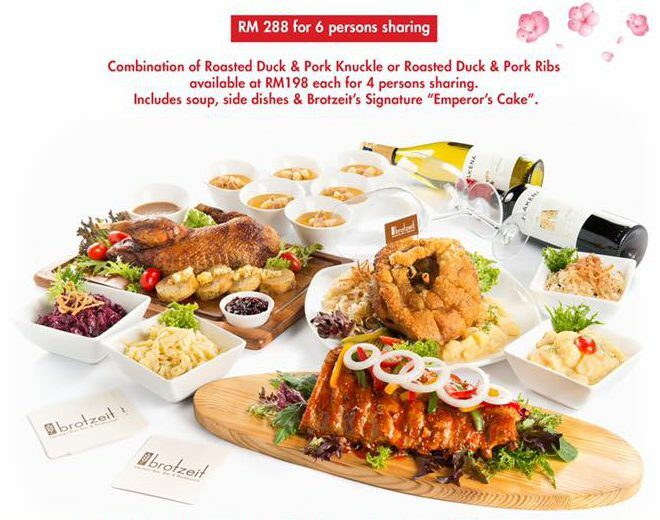 With a platter going for RM288, it’s recommended for a group of 6. Did you know that Morganfield’s was a locally founded brand? 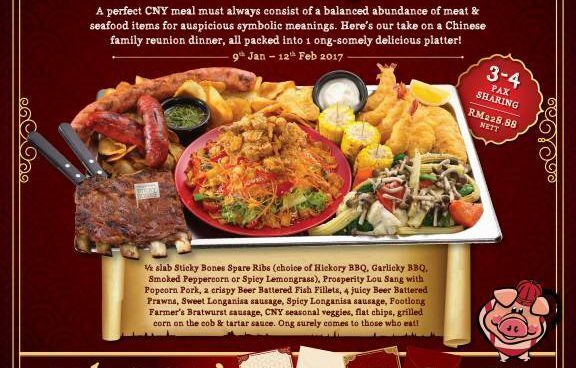 To commemorate CNY, they have launched a Tray of Togetherness, containing all of the porky favourites with ribs and sausages, including even a Morganfield’s take of Yee Sang, designed for sharing between families (RM288 for 3–4pax). From a small group of 4 to a larger gathering of 8, Hana Dinking Sake Bar has planned out bountiful feasts for 4, 6 or 8 pax. 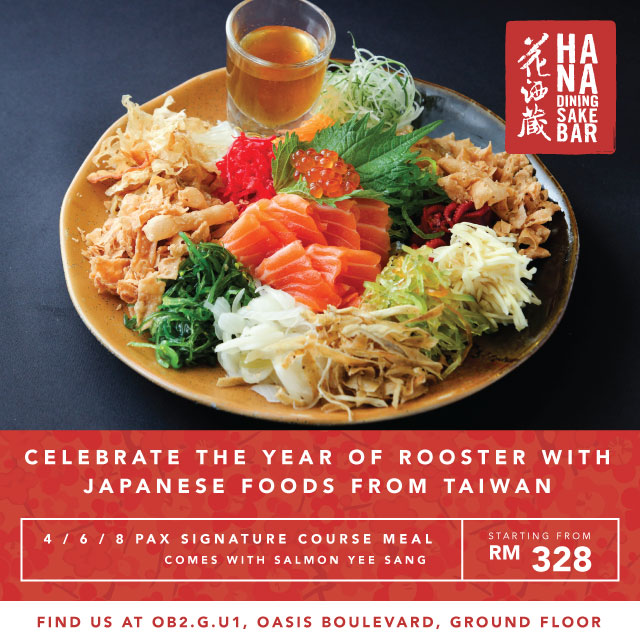 The menu includes Japanese food staples like Chicken Karaage, Soft Shell Crab, Tofu Cheesecakes and Kaisen Udon. A full list of each set can be found here. 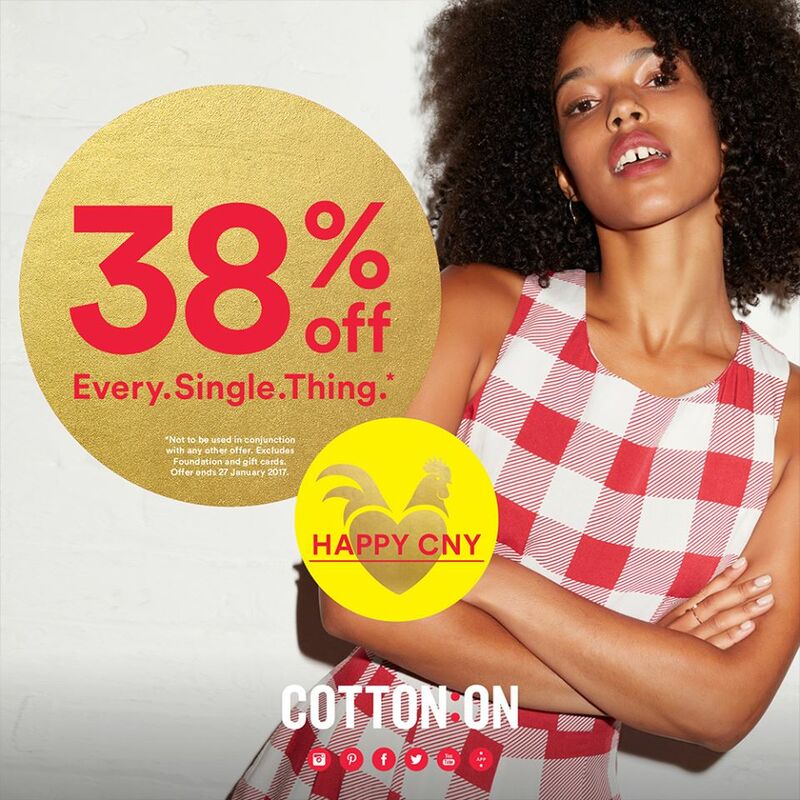 For the year of the rooster, Cotton On is offering 38% off all of its items, from new arrivals to last month’s trends, big or small items. The offer is valid until the 27th of January. 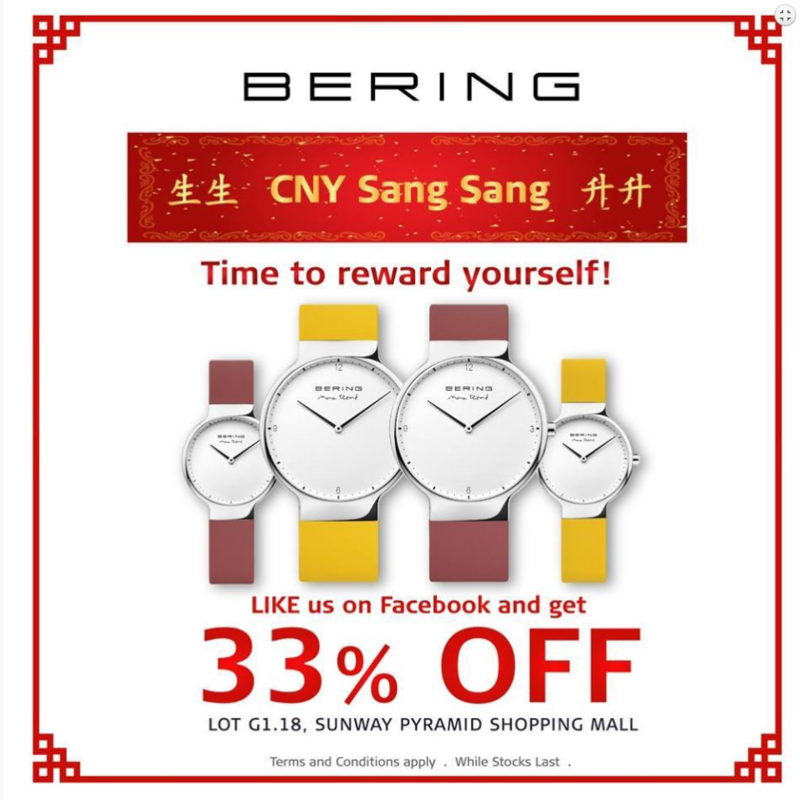 “Like” their Facebook page and enjoy 33% off timepieces in Bering. 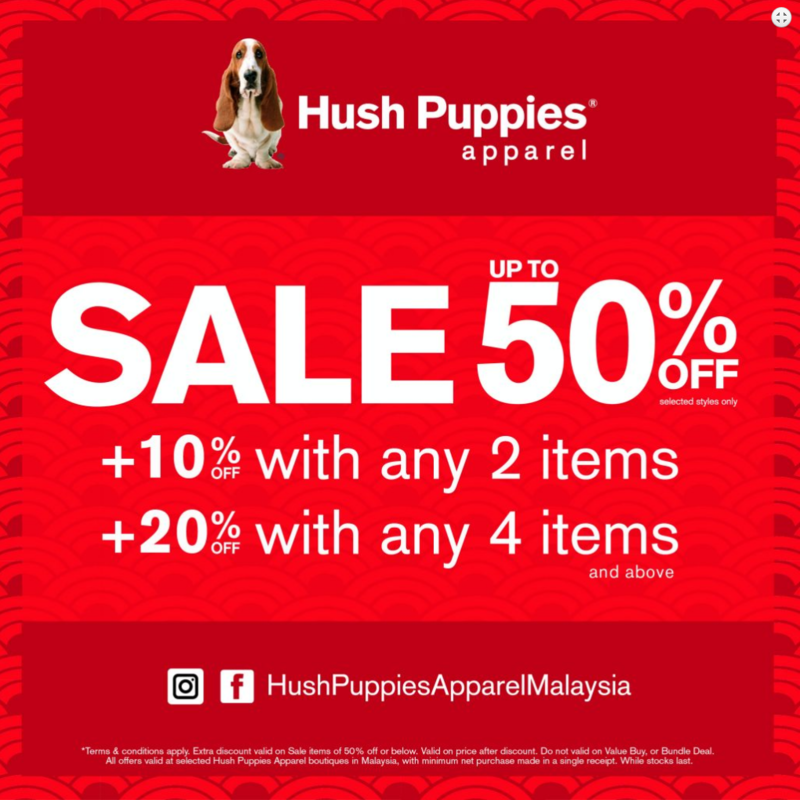 Hush Puppies is having a Chinese New year sale for up to 50% off, with additional discounts for bulk purchases. 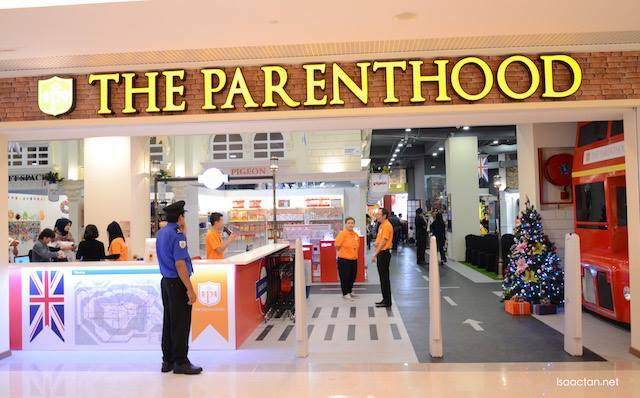 On top of that, they’re also giving out free gifts. Purchases above RM188 will get you Hush Puppies Ang Pau,while purchases above RM388 will get you Ang Paus and thermos flasks. Finally, purchases above RM600 will get you all the above items, plus an overnight bag. 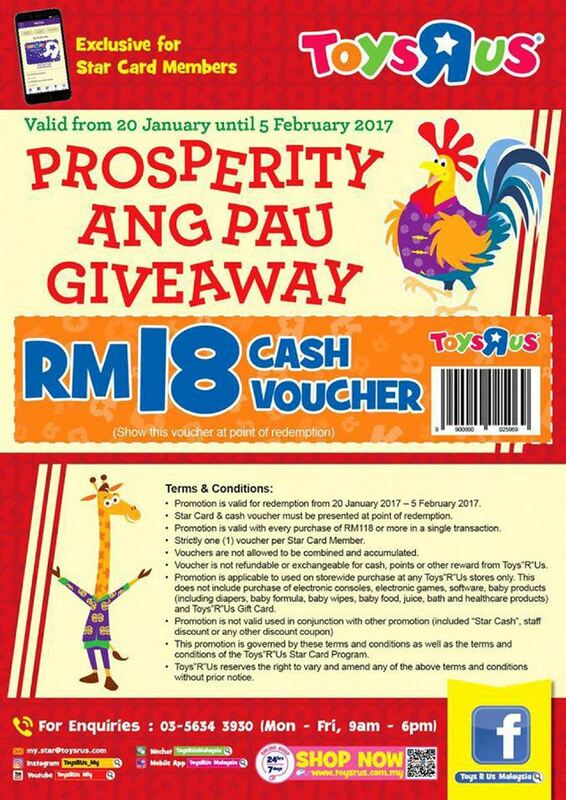 Exclusive for Star Card Members, Toys “R” Us is giving away RM18 cash vouchers, valid for purchases of RM118 or more in a single receipt. The voucher is available on Toys “R” Us catalogues. For mummies getting a new Chinese New Year hairdo, GEM studios, located next to The Parenthood will give away a free playland ticket that includes one-on-one care for your child. Find out more here. 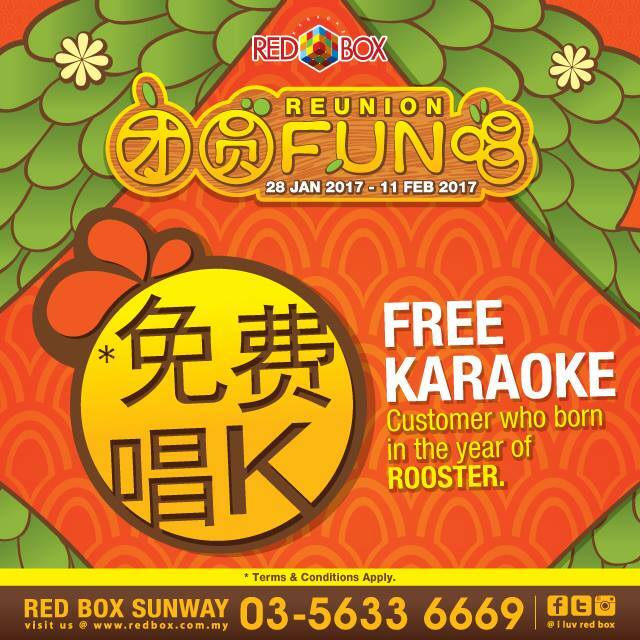 Valid from January 28 to February 11, Red Box Karaoke is giving out free Karaoke sessions for everyone born in the Year of the Rooster. On top of that, on Chinese New Year Eve (January 27 2017), they are also offering 50% off for all takers. 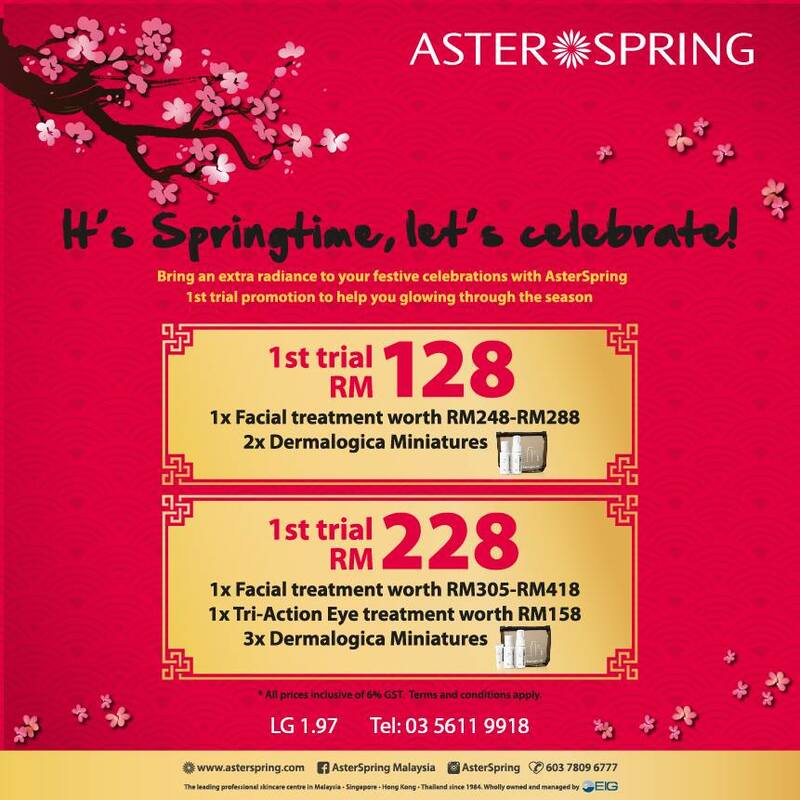 Exclusive for first-timers looking for a facial from a premium brand, Aster Spring is offering some springtime discounts. The promotion comes in two tiers, one for RM128 and the other for RM228. The second option offers a higher-value facial, and buyers will also receive Tri-Action Eye Treatments and 3 Dermalogica miniatures each. 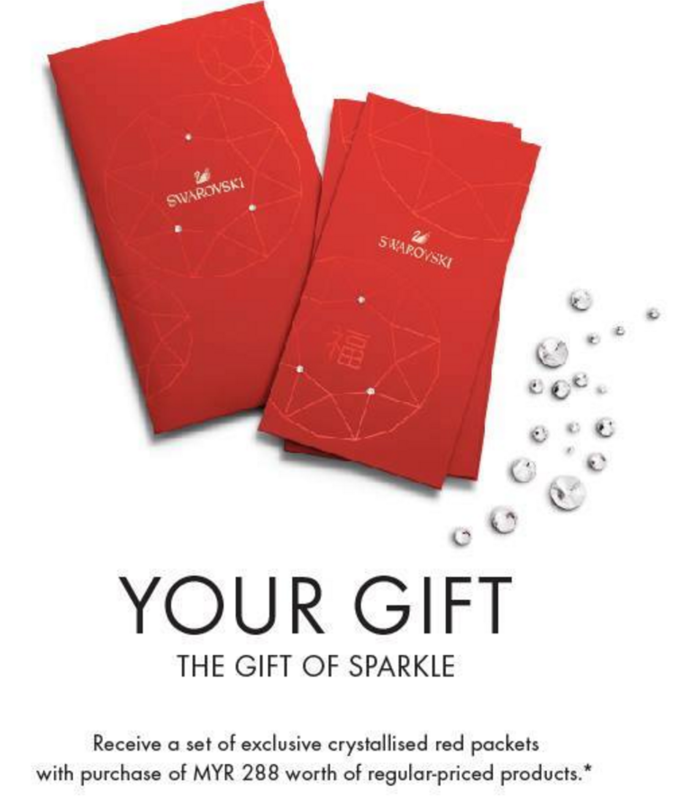 Experience gifting one-of-a-kind crystallised Ang Paus if you spend Rm288 and above in Swarovski. From 16 January to 15th February, get some sizeable discounts on brand new smartphones in ThunderMatch. On top of just their phones, ThunderMatch offers discounts for everything from Razer Gaming headsets, keyboards, Bluetooth subwoofers, to even higher tier items like printers and laptops. A highlight includes the Samsung Galaxy S7 Edge, on sale for RM2,799 instead of RM3,099 retail price. The full catalogue of items is available here. 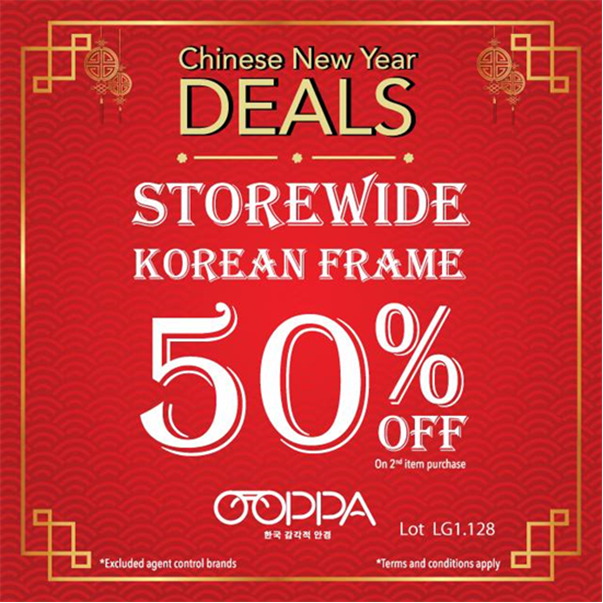 The OOPPA eyewear store specialises in Korean eyewear fashion inclusive of both shades and corrective glasses. They are offering a 50% storewide discount on all second eyewear purchases. The promotion does not include agent-controlled brands. 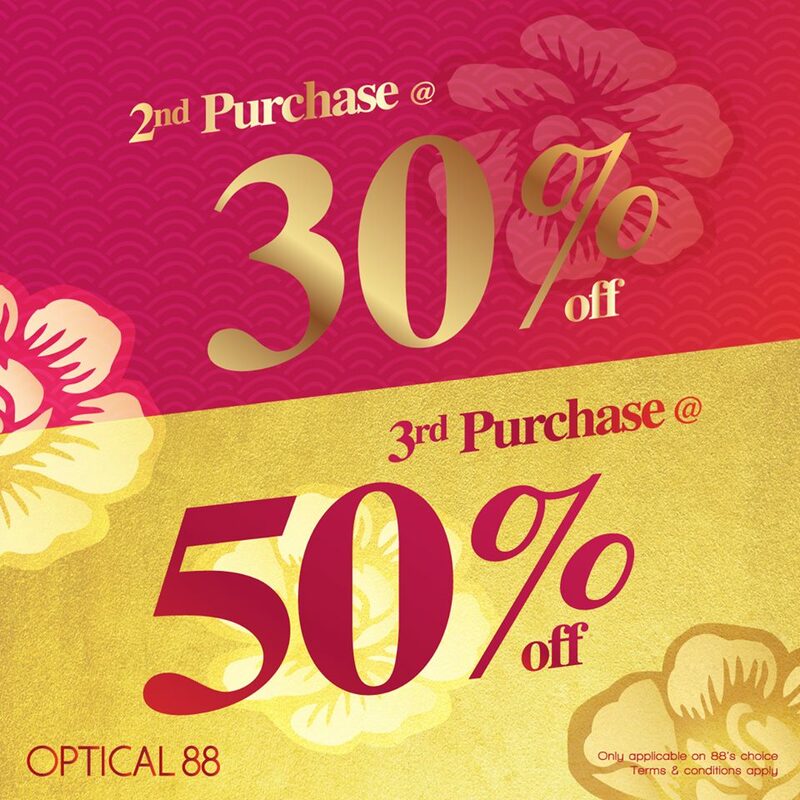 For more options on glasses and eyewear, a second purchase on Optical 88 gives the second product 30% off, and a third purchase for 50% off. Do note that this is only available for certain brands and packages, of Optical 88’s choice. 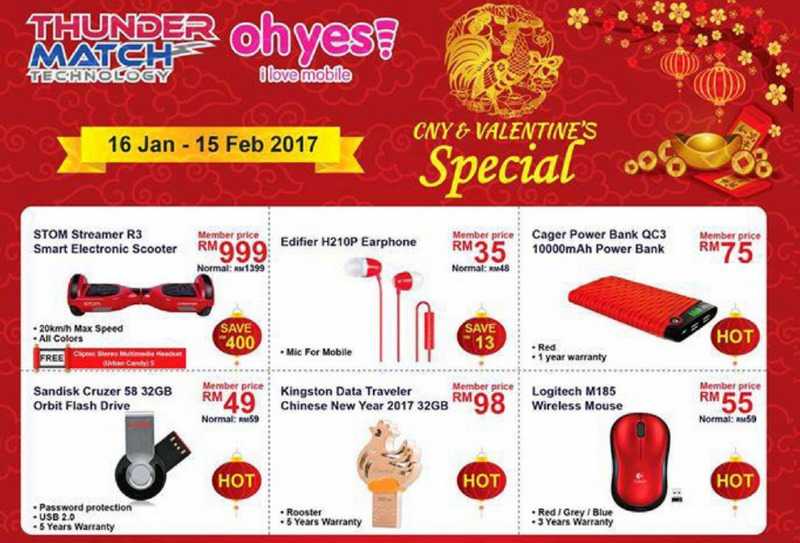 They are also offering free CNY Ang Paus for every purchase above RM118.